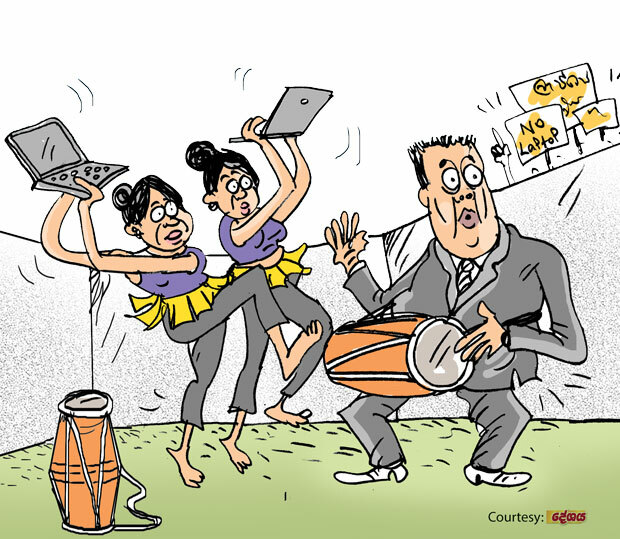 The laptop dance expected to feature at the national day celebrations had to be dropped at the eleventh hour due to strident protests by teachers and parents, they say. This dance item was readied as a feature on a proposal by a key purohita who wanted to use it as a symbolic message that the government is committed to fortifying the schoolchildren with the latest technology. This purohita hailing from the South had also proposed featuring two other dance items as well, one sporting telescopes and the other sporting world globes. Even a pro-government teacher union was among the organizations highly critical about the proposed novel dance features, they say. The parents, teachers and the unionists should have been asked to the dance and given a Top Lap for doing so!! !